Primary adrenal sarcomas are exceptionally uncommon and include leiomyosarcoma, malignant peripheral nerve sheath tumor (MPNST) and angiosarcoma. Reviewing the literature, we encountered only twelve previously reported cases of primary adrenal leiomyosarcoma (PAL). We believe that this is the thirteenth case of PAL. It has a wide range of differential diagnosis including MPNST, malignant melanoma, gastrointestinal stromal tumour (GIST); metastatic carcinoma and others. A complete workup including radiological, biochemical, histomorphological and immunohistochemical investigation is essential for the final diagnosis of PAL. We encountered a rare case of PAL fulfilling the clinico-radiological and histomorphologicaland immunohistochemical criteria, which has prompted us to report this case. A 60 year old lady presented with a 5 month history of left upper quadrant abdominal mass which was painful and gradually increasing in size. She denied any history of fever, weight loss, nausea or vomiting. Past medical, surgical or family history was non-contributory. On general physical examination, the patient was averagely built and nourished. She had a pulse of 64/minute and blood pressure of 120/80 mm Hg. There was no evidence of pedal edema or lymphadenopathy. On per abdominal examination, a 5 × 4 × 3 cm mass was palpated in the left hypochondrium. The mass was firm, non-tender, non ballotable and did not move with respiration. There was no evidence of hepatosplenomegaly or ascites. Routine laboratory investigations were non contributory. The 24 hours urinary vanillylmandelic acid level was within normal limits. HIV-1 and HIV-2 antibody tests were non-reactive, as was HBsAg. Liver function tests, serum amylase and tumor marker CA-19.9 were also within normal limits. 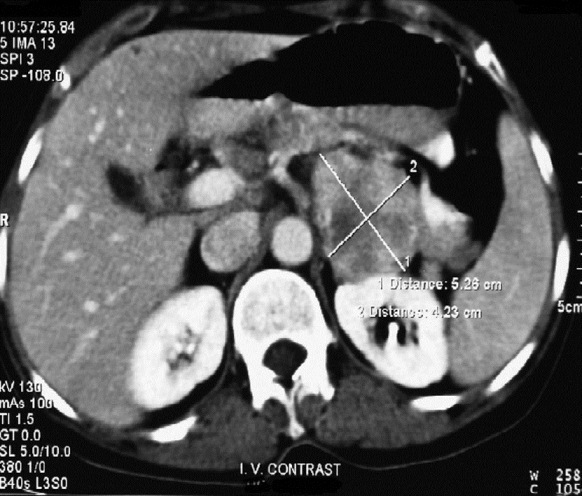 Computed Tomography (CT) scan of the abdomen revealed a well defined soft tissue lesion measuring 5.2 × 4.5 × 3.8cm in the left upper abdomen posterior to the body of the pancreas and anterior to the left kidney, showing heterogeneous enhancement on contrast. The mass was thought to be a lymphoid or a pancreatic mass [Figure 1]. Careful clinical and radiological examination did not reveal any other primary tumor site or distant metastasis. Exploratory laparotomy was performed. A retroperitoneal mass arising from the left adrenal gland was seen which was dissected and excised. Post-operative course was uneventful and the patient was symptom free with no evidence of recurrence or distant metastasis 21 months after surgery. On Gross Examination the tumor was a 5.2 × 4.5 × 3.8 cm, thinly encapsulated firm mass with a bosselated appearance almost completely replacing the adrenal gland [Figure 2]. On sectioning, the cut surface revealed uniform, grey white color with streaks and strands and a whorled appearance in places. It did not show areas of hemorrhage or necrosis. On microscopic examination the adrenal mass showed a thinly encapsulated tumor composed of spindled neoplastic cells arranged in interlacing bundles and fascicles of varying sizes. The individual cells showed moderate eosinophilic cytoplasm and cigar shaped nuclei with dispersed chromatin. At the periphery of the tumor, part of the normal appearing adrenal cortex was identified from which the tumor was arising [Figure 3]a. The tumor showed nuclear pleomorphism, giant cell formation and 10 to 12 abnormal mitotic figures per 10 high power fields [Figure 3]b. The stroma showed numerous congested blood vessels; however, no areas of necrosis or lymphovascular invasion were identified. Immunohistochemistry was performed with the following primary antibodies - vimentin (Clone V-9, Biogenex), cytokeratin (CK) (clone AE-1/AE-3, Dako), HMB-45 (clone HMB-45, Dako), smooth muscle actin (SMA) (clone 1A4 Dako), desmin (clone 33, Biogenex), S100 protein (polyclonal S100A4, Dako), CD117 (clone T595, Novacastra), CD34 (clone QBEnd/10, Novacastra). The neoplastic cells showed strong cytoplasmic reactivity for smooth muscle actin [Figure 4]a, desmin [Figure 4]b and vimentin. They were negative for CK, S100 protein, CD117 and HMB-45 and CD34. Based on these findings, final diagnosis of primary leiomyosarcoma of the adrenal gland was offered. Primary adrenal mesenchymal tumors are exceptionally rare, and are thought to arise from the smooth muscle wall of the central adrenal vein and its tributaries. A review of the literature revealed only twelve previously reported cases of PAL. The reported age of patients ranged from 30 to 75 years with approximately equal frequency in males and females. All these tumors ranged in size from 11 to 25 cm in greatest dimension. In only one case report, the tumor was 3 cm in size. It is worth mentioning that our patient was HIV and HBsAg negative. In the differential diagnosis of the present tumor we considered: metastatic carcinoma; metastatic sarcoma; MPNST; malignant melanoma; GIST and primary retroperitoneal sarcoma infiltrating into the adrenal gland. 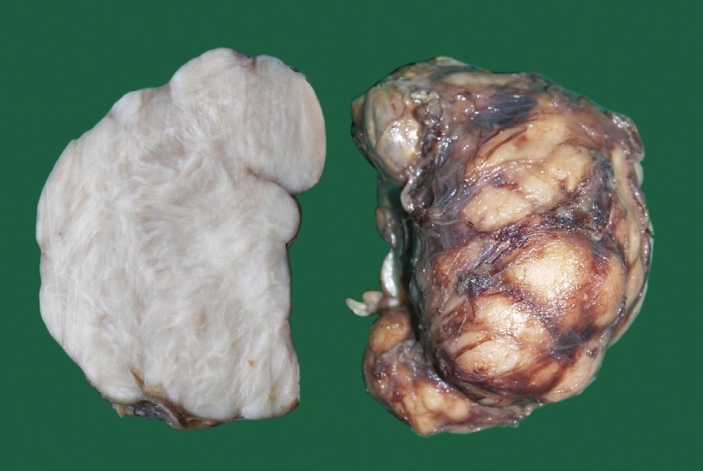 A primary adrenal tumor was favored over a metastatic tumor because of the unilateral involvement of adrenal gland and lack of cytokeratin expression. Distinct demarcation of the present tumor from the surrounding structures by an intact capsule ruled out the possibility of extra-adrenal sarcoma extending into the adrenal gland. Lack of S100 protein expression and strong SMA and desmin positivity favored the diagnosis of leiomyosarcoma over MPNST. Malignant melanoma would express HMB-45 and/or S100 protein. Lack of expression of CD117 ruled out GIST. Taking into consideration the above findings coupled with radiological and clinical observations, a final diagnosis of PAL was made. PALs carry a poor prognosis; with the longest disease free survival being 20 months. Our patient did not have any metastasis 21 months after surgery and we are following the case with sustained enthusiasm, this follow up period is comparable to the longest disease free survival reported. In conclusion, diagnosis of leiomyosarcoma of adrenal gland is one of exclusion and is based on radiological, biochemical, histomorphological and immunohistochemical evaluation. PALs carry a poor prognosis when morphologically they are large in size andhistologically show lymphovascular invasion and high grade nuclear features throughout the tumor in such cases judicious use of radiotherapy and chemotherapy may be contemplated; however, complete surgical resection is of paramount importance in their treatment. We believe that low grade features, absence of lymphovascular invasion and necrosis, favor long term survival after aggressive surgical resection. 2. Mencoboni M, Bergaglio M, Truini M, Varaldo M. Primary adrenal leiomyosarcoma: A case report and literature review. Clin Med Oncol 2008;2:353-6. 3. Lack EE, Graham CW, Azumi N, Bitterman P, Rusnock EJ, O'Brien W, et al. Primary leiomyosarcoma of adrenal gland. Case report with immunohistochemical and ultrastructural study.Am J Surg Pathol 1991;15:899-905. 4. Lujan MG, Hoang MP. Pleomorphic Leiomyosarcoma of the adrenal gland. Arch Pathol Lab Med 2003;127:32-5. 5. Lee CW, Tsang YM, Liu KL. Primary adrenal Leiomyosarcoma. Abdom Imaging 2006;31:123-4. 6. RosaiJ. Peritoneum, retroperitoneum, and related structures. In:RosaiJ, editor. Rosai and Ackerman's Surgical Pathology. 9 th ed. Edinburgh, Scotland: Mosby; 2004. p. 2373-415. 7. Rosenthal JT, Colonna JO, Drinkwater DC. Leiomyosarcoma of the vena cava with atrial extension: Long-term survival following resection and caval replacement without circulatory arrest. Urology 1995;46:876-8. 8. Etten B, van I jken MG, Mooi WJ, Oudkerk M, van Geel AN. Primary Leiomyosarcoma of the adrenal gland. Sarcoma 2001;5:95-9. 9. Shmookler BM, Lauer DH. Retroperitoneal leiomyosarcoma: A clinicopathologic analysis of 36 cases. Am J Surg Pathol 1983;7:269-80. 10. Zetler PJ, Filipenko JD, Bilbey JH, Schmidt N. Primary adrenal Leiomyosarcoma in a man with acquired immunodeficiency syndrome (AIDS). Further evidence for an increase in smooth muscle tumors related to Epstein-Barr infection in AIDS. Arch Pathol Lab Med 1995;119:1164-7.